Minding Houston: Episode XII – I say hey! What’s going on? August is supposed to be a quiet month in Houston. The constant hum of everyone’s air conditioning running as we try and avoid the triple digit heat just as the fire from the last legislative session starts to die down is normally a time when Houston settles down and gets ready for the fall. However at Mental Health America of Greater Houston, we’ve never been busier. From integrated care, to veterans’ mental health, and mayoral politics, it is a crowded event calendar in August. In Episode XII of Minding Houston, we will let you know exactly what’s going on, and how you can be a part of it. So first things first, integrated care is one of the primary buckets of work we engage the community in here at MHA of Greater Houston. Our efforts are led by Alejandra Posada, Director of Education and Training. Using the MHA of Greater Houston systems change model that has previously been used with efforts like public safety reforms with the Houston Police Department, Ale is brining quite an impressive group of local and statewide leaders together for the kick-off this Thursday at 9am at the Baker Institute at Rice University. Bill Kelly: What is the systems change initiative model you are following? Alejandra Posada: We are following a systems-change model that MHA has successfully used to address other important systemic issues – issues such as law enforcement interaction with mental health consumers; the trajectory of youth with mental health needs in the juvenile justice system; veterans’ behavioral health; and the prevention, early identification and treatment of behavioral health issues among school-age children. We call the process “Interest Based Negotiation,” IBN for short, and it is influenced by consensus-building approaches and Appreciative Inquiry. Basically, it’s a process of bringing together the diverse stakeholders concerning a particular issue to undertake an intensive process of information-gathering and analysis, and ultimately to come to a consensus on recommendations to address the issue. During this process, MHA works very hard to ensure that our role remains that of a coordinator for the initiative and does not develop into a role where we are “in charge,” so to speak. For the process to be successful it’s very important that the stakeholders around the table fully own the process. We get the process going, but the stakeholder group then takes the reins to make it happen. Kelly: Okay, the kickoff event is this Thursday. Who are you bringing together? Posada: We are very excited about the kick-off event this Thursday, for which we are very fortunate to be partnering with the Center for Health and Biosciences at the Baker Institute for Public Policy at Rice University. We’ve brought together representatives from key stakeholder groups, including health care providers, third-party payers, institutions of higher education, public officials, and others with a stake in the issues. From interested parties in this group, as well as others who join us, we will form the core group of stakeholders who will collaboratively undertake the IBN process. Kelly: If people want to be involved that cannot attend, what’s the best way to do so? Posada: I’ve told a few people who are interested in the initiative but cannot attend on Thursday that this event, as fantastic as we expect it to be, is just a kick-off. The real work will happen subsequently. Anyone who is interested in participating can contact myself or Bill; our contact information in on the MHA website. Also if anyone out of town or who can’t make it to Rice on Thursday would like to view the event, it will be livestreamed. To view the livestream, just go to the event page on the Baker Institute’s website at the time of the event. We’ll also make the livestream available afterwards. The success of this initiative depends entirely on the collaborative participation of stakeholders, so if you’re interested, please do contact us! The invitation to the forum is listed below. It should be a very engaging conversation on the policies that can lead to better trained and better financed behavioral healthcare for all Texans. Next, and by that I literally mean the next DAY, MHA of Greater Houston proud to once again partner with the Michael E. DeBakey VA Hospital to host the 2015 Veterans Mental Health Summit. 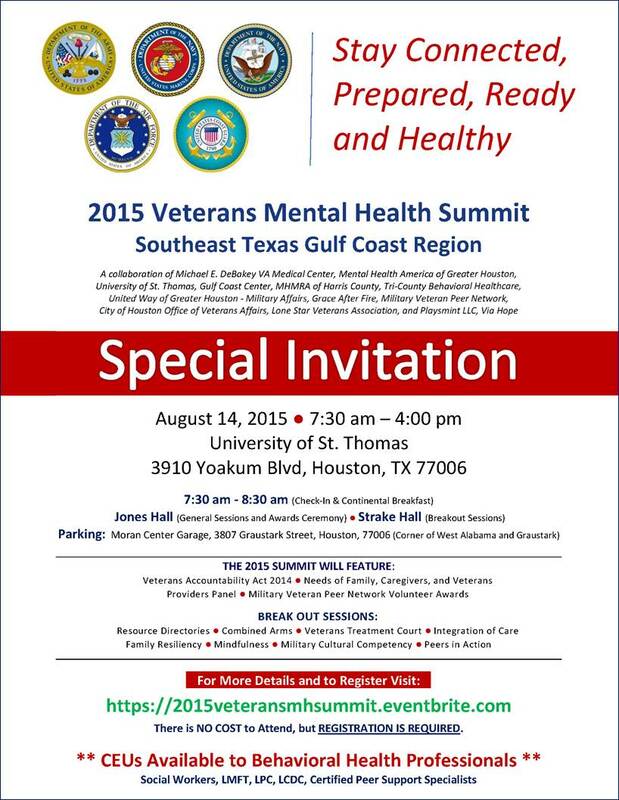 On Friday, August 14th at the University of St. Thomas starting at 8:30am, the 2015 Southeast Texas Gulf Coast Veterans Mental Health Summit builds on relationships spawned by the previous two Summits and aims to stimulate new connections that are necessary to promote Veteran-centered, recovery-oriented care. Active collaboration and coordination of care with partners across our community is critically important to facilitate awareness and use of VA mental health resources, help Veterans gain access to community services, and build healthy communities that provide an integrated network of support for Veterans and their families. Bill Kelly: How many times as Mental Health America of Greater Houston helped with the Veterans Mental Health Forums? Tony Solomon: Bill, this will be out third time working on the Veterans Mental Health Summit with Michael E. DeBakey VA Medical Center and this year we brought on some new partners like Lone Star Veterans Association, Harris County MHMRA, Playsmint, ViaHope and some others. Kelly: What is the real content that people could expect to hear and learn? Solomon: The purpose of this event is to improve collaboration between the VA and community agencies in the service of Veterans and to understand better the needs of Veterans and their families. We have built in networking and presentations of community collaborative work, issues, and training available for service providers to add to their tool kit when serving veterans and their families. CEUs will be available for behavioral health professionals, including social workers, licensed marriage and family therapists, licensed chemical dependency counselors, and peer support specialists. Finally, for those of us in Houston, you just might be aware of an election coming up in November. We’ve partnered with three great advocacy organizations: National Alliance on Mental Illness, the Houston Recovery Initiative, and the Council on Recovery in hosting a Mayoral Forum on Behavioral Health. The Forum is scheduled for Monday, August 31st at the University of St. Thomas’s Jones Hall at 6:30pm. Now, unlike just about every other forum during the campaign, we will not be talking about transportation, pension reform, or spending caps. We will be very focused on the behavioral health programs that the City of Houston directly funds. It is vital to good advocacy that we show the seven candidates for mayor just how many people care about these programs. We hope that you will attend and even bring a friend or two. Advocacy matters, and in this case, making sure the next Mayor of Houston understand the vital importance and political popularity of these programs . To give you an idea of what we will be discussing, I invite you to check out the link below to see a history of the Mental Health Division at the Houston Police Department. There, you can see a timeline that shows the progress and now national leadership that HPD has in training officers and deploying mental health professionals to help in times of crisis. By no means are these three events the totality of what MHA of Greater Houston is working on during August. Numerous Mental Health First Aid trainings coordinated by Janet Pozmantier are ongoing during the summer when classroom teachers have flexibility. Tony’s recently completed VCAMP helped train over 20 Military Veteran Peer Network leaders from across Texas just last week. Ongoing women’s mental health and other trainings continue to provide the badly needed skill in screening and referral of mental health services throughout the month of August. But I highlight these three events as some of the best ways you can personally attend and see how Mental Health America of Greater Houston is affecting policy change on the ground. And that’s really what Minding Houston, is all about. 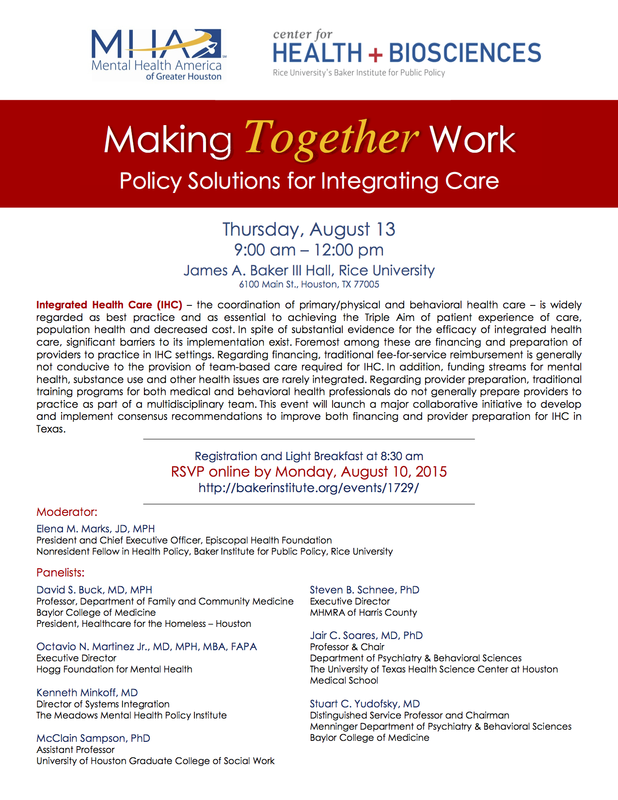 To attend Making Together Work: Policy Solutions to Integrated Care or observe the livestream on August 14, visit our event page at the Baker Institute for Public Policy website. 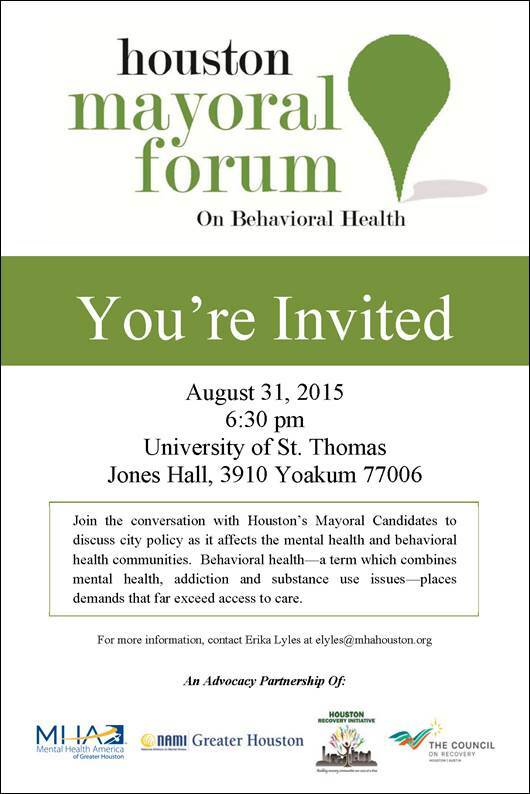 To RSVP for our Mayoral Forum for Behavioral Health on August 31, register at our Eventbrite.You can find more information about the Houston Police Department’s Mental Health Division and the history of our Crisis Intervention Team at HoustonCIT.org. Music from this episode: “I love the Blues” by the Bluesraiders, “Hotel Rodeo ft. D Spliff” by Anitek and “Flutey Funk” by Kevin MacLeod.